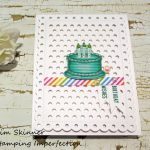 Polka-Dot Pieces With Stampin’ Up! Polka-dots can somehow be completely irresistible…as long as I’m not expected to wear them! 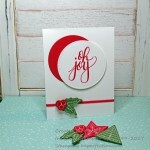 I just could not resist the Polka-Dot Pieces stamp set and the Polka-Dot Designer Series Paper that Stampin’ Up! carries. The stamp set coordinates with at least 6 punches! How can I resist this coordinating stuff?! I settled on a monochromatic color scheme today. For some reason, I really like a monochromatic scheme with the polka- dot paper. I feel like those polka-dots really are the star of the show! 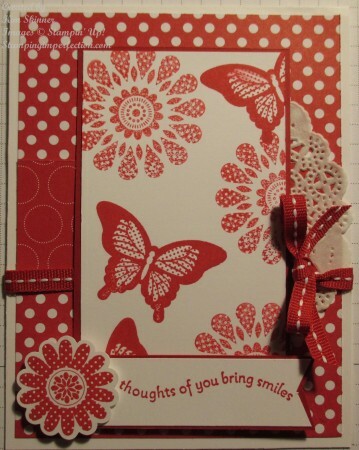 The large polka dot flowers were stamped off once and then stamped on card stock. 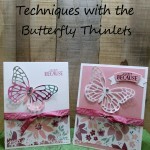 The butterfly images were stamped directly onto the card stock. Only 1/2 of the lace doily is needed here, so you can the rest for another project! 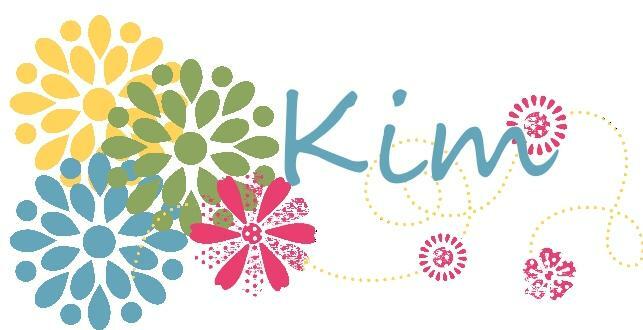 The small flower can be punched with the 1-1/4″ circle or scallop circle, the larger flower with the 1-3/4″ circle or scallop circle punch, the butterfly with the elegant butterfly punch and the bird image with the bird builder punch! 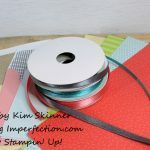 The small piece of patterned paper is the back of the polka dotted print! Remember that all designer series paper is two sided and the images are different, but coordinate with the front! Thanks! 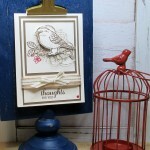 I think the Polka-dot papers give us great color choices for cards!